The “video+” movement rolls on. We’re hearing about video+email, video+direct mail, video+advertising, and so on, each one focused on using video not as the central medium of a marketing campaign, but as an auxiliary medium that enhances the message. The next entry seems to be video+social, a movement toward using video to enhance a brand’s social media presence. Social video is not a thing so much as it is an overarching theory. The theory seems to go like this: Video has the ability to spread naturally among the members of a social network, and ultimately between networks (we used to call this “going viral,” but that’s out of vogue at the moment). Social video is video that is optimized for this specific purpose — not necessarily “viral” video, but video content that is relevant to and easily sharable among members of a network. There are a variety of reasons why you should use social video. The fact that your content can be shared among peers means that your target buyers may never get a message from you at all. Instead, they’ll get a referral from their friends. Are you more likely to trust a link from a friend that says, “Check out this cool video I found!” or a link from a company that says, “Check out this cool video we made!”? Probably the latter. This is particularly good, because it means that in order to reach a large number of buyers, you don’t necessarily need to have a large number of social media followers. Once content starts spreading among the members of a network, your job is essentially done. Just sit back and let the network do your work for you. How do I create social video? Create really specific video content. We’re talking crazy specific, addressing the specific problems of a person with a particular title in a particular industry at a particular time of year. Marketing professionals at small credit unions during tax season, for example (if they have problems your product solves). Optimize your content for sharing. Make sure your video has prominent sharing buttons for the social media outlets you’re trying to target. Video landing pages and microsites are great for this, because they also let you incorporate text and graphics to really make your video and offer pop. That’s it. It’s important to realize that this is a high risk/high reward kind of strategy. After all, you’re banking on the fact that a few influential people will become brand advocates, and that this will influence others to engage with your content. Unlike broader messaging, you can’t play the averages and create a predictable return. For example, if I send an email to 500 people, I’m relatively certain that 95% will receive the email, a certain percentage will open it, and a smaller percentage will click through. If I target the same 500 people with social video, however, I stand a much better chance of engaging those 500 contacts. The problem is that reaching those contacts in the first place is contingent upon one influential individual finding my content interesting and sharing it with his followers. If he doesn’t, I have no chance at all of reaching them. The whole video+social thing is intriguing because of its potential pay-out. But I don’t think the average marketer knows enough about social media (much less video) to make it particularly effective right now. My fear is that social media will evolve past the point of marketing usefulness well before video+social becomes widespread. All the more reason to become an early adopter, I suppose! Wayne Wall is Executive Director of the Web Video Marketing Council. He can be reached at wwall@flimp.net. Are you wondering how you can use Web video to augment your marketing efforts? Wonder no more. 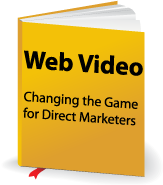 Click the big yellow book to download our white paper “Web Video: Changing the Game for Direct Marketers“.